We went; we saw; we conquered! Several team members from Cottage Grove Vintage Market visited High Point Market on Monday scouting the latest trends and upcoming directions of home interiors. 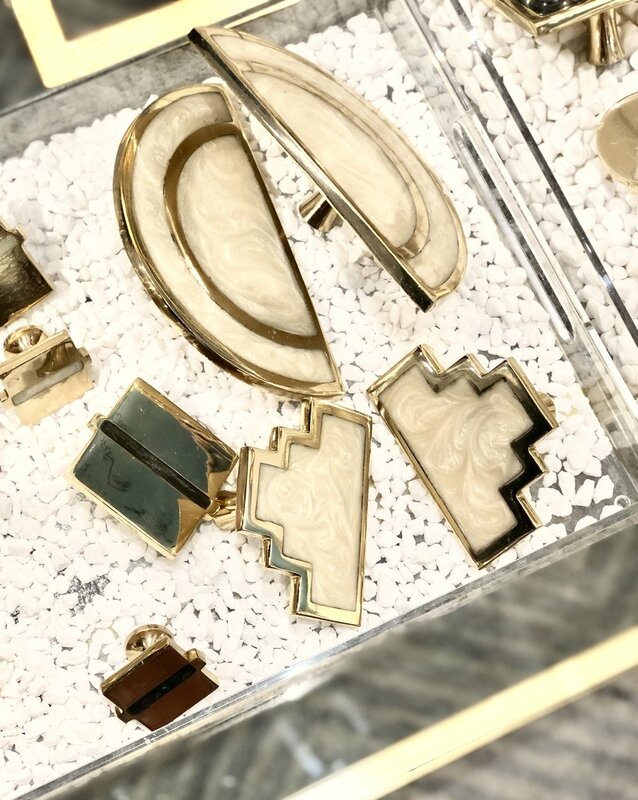 These are the top styles seen throughout showrooms and we’re eager to share them with you! This color scheme has been around for centuries and has definitely experienced a resurgence in recent years. It’s hard to call it a trend when it’s a classic combination, but the blue and white color grouping was everywhere! And in all types of styles! If your brain immediately jumps to chinoiserie when you think blue and white, imagine it in bohemian vibes, modern shapes, touches of brush strokes, and marbled textures. Blue and white has no limits in home decor. Take note: blue and white in marble tie dye with a painted frame. Blue and white was on everything…big pieces and accents. Woven styles of rattan, wicker, bamboo, and all types of natural elements are being incorporated in interiors through furniture, lighting, and accessories. Many showrooms displayed it with a contrasting smooth structure, like brass or lacquered furniture. Nearly every brand had some sort of rattan lighting in oversized pendants or chandeliers. Notice how the natural wood is capped with a brass accent. Here, the natural caning is paired with a glossy, white chair frame. Rattan, wicker, natural elements on all types of lighting! We’ve been saying for a while that “brass is back,” and from the looks at market, it’s here to stay. The warm metal truly brightens spaces and offers a warm reflection. 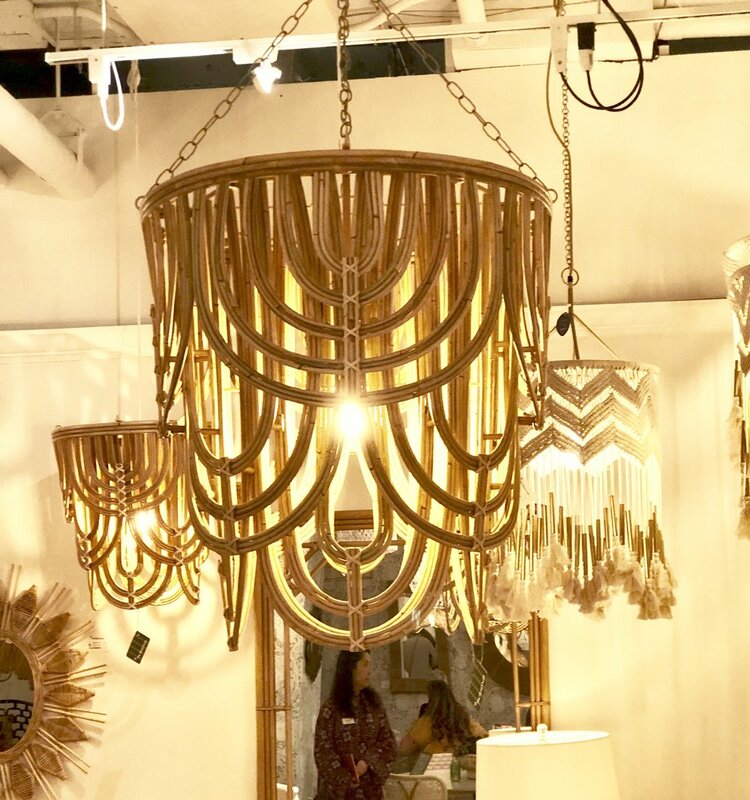 Lighting fixtures, small furniture, decorative objects and accents--brass isn’t disappearing! From accents to tables, gilded items were all around. Notice how this large piece incorporates many trends: the bright brass, wicker underneath the pattern, and glossy white as a background for the floral motif. 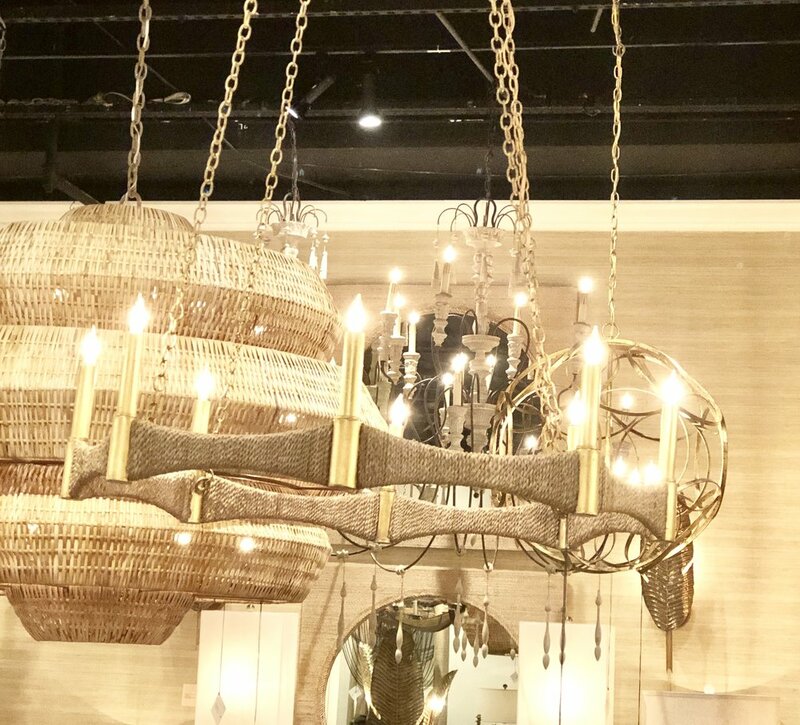 See how the natural rope is wrapped around the brass frame of this chandelier. 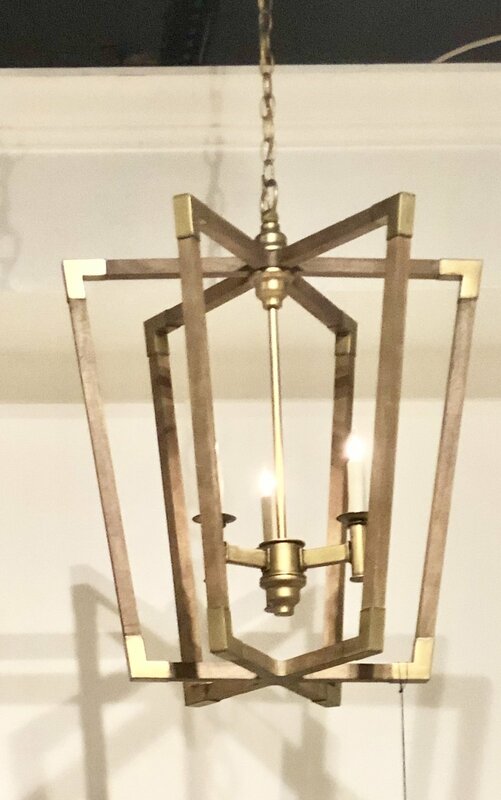 The light, washed wood capped with brass ends. Pulls and knobs are a great way to transform a piece of furniture and the styles we saw at market were statement making pieces. Chunky knobs in brass and oversized pulls were on all types of furniture. Take a look at the size of the drawers compared to the samples of hardware on the front—large and in charge! Deep colors of emerald, raspberry, and sapphire (more tones of blue) were lacquered on furniture and upholstered in luxurious velvet and soft, leather on sofas, ottomans, and wingbacks. Turquoise velvet piped in deep indigo. Making a statement with reflective emerald! Plush leather and velvet in emerald. Continuing with the bold colors, furniture was showcased in all hues, on all types of pieces. This is another area designers are adding blue, jewel tones, and big hardware--combining three trends just in one piece! Notice the glossy lacquer of the furniture (in multiple colors) that allows the gold and lucite giant pull to standout. 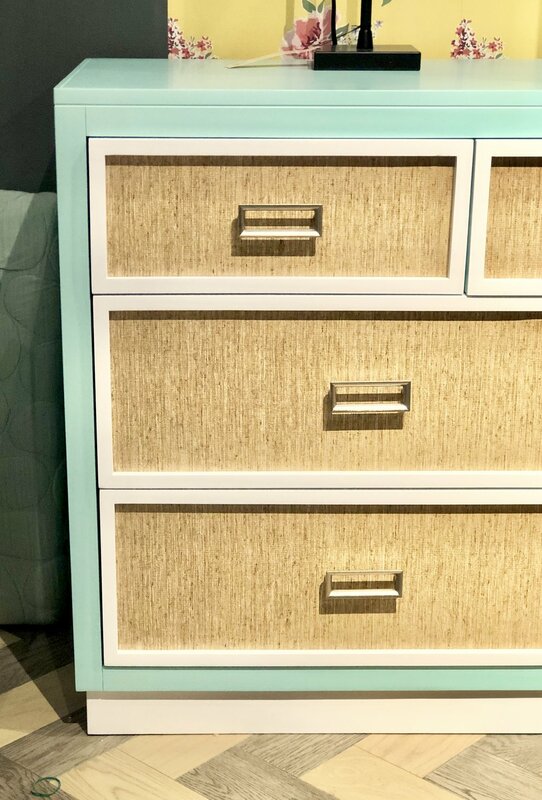 Combining three trends here: painted furniture, grasscloth, and big hardware. Again, in lots of blue and white, marbled techniques and painted strokes are being added on everything from glossy furniture, to canvases and art, to ginger jars and small accessories. 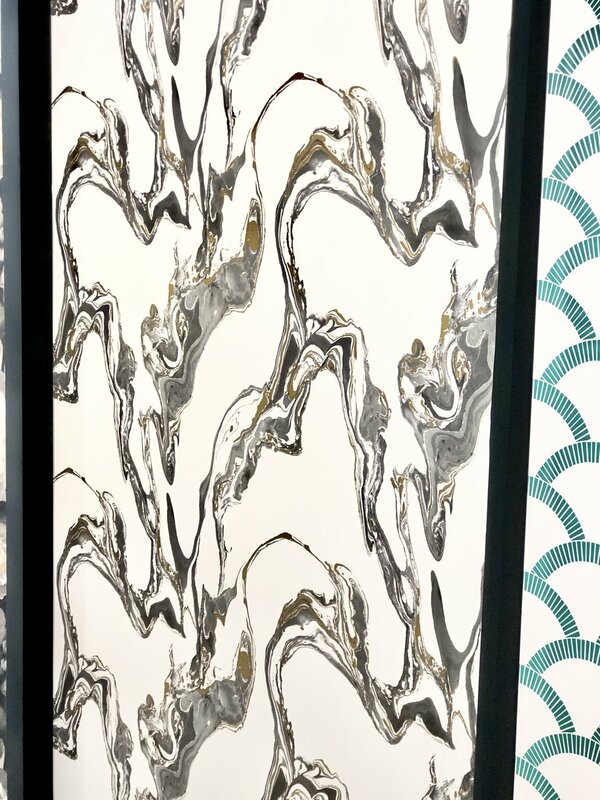 These Tempaper marbled wallpapers are available in the store! First, check out the canvas in the back—painted, loose, dripping hues. Then, notice the jars—deep blues with brush strokes of gold with a very large handle. Blue and white has gone modern on classic shapes. Sherwin Williams declared coral is the 2019 color of the year and it was visible at market. Many showrooms featured slight deviations of the hue, going slightly deeper into oranges and almost red, or into the pink spectrum. The pink end of the coral spectrum. And the orange end of the coral spectrum. 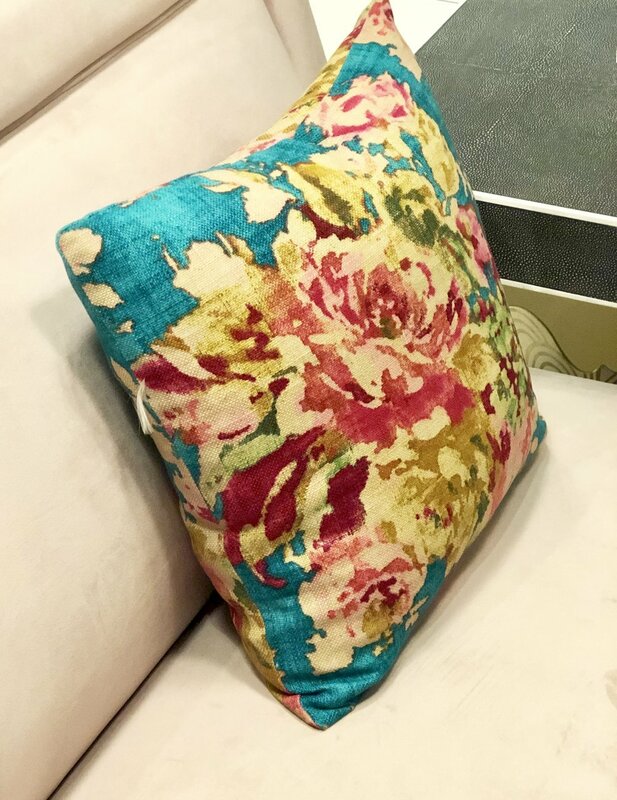 Stay tuned for an upcoming posts of items in store to bring these trends to your home and come visit— we’ll be glad to help you select on trend, vintage items for your home and personal style!